해인사를 뒤로 돌아 가야산(伽倻山) 정상으로 올라가는 길 옆의 바위에 돋을새김으로 높이 7.5m의 불상을 표현하였다. 민머리에는 상투 모양의 머리묶음이 크고 높직하다. 미소가 없는 풍만한 사각형의 얼굴에는 날카로운 눈꼬리, 두꺼운 입술, 턱주름 등이 표현되었으며 귀는 어깨에 닿을 듯 길고 목에는 3개의 주름이 뚜렷하다. 어깨는 넓고 당당하여 얼굴과 함께 자신만만한 자세의 불상을 나타내고 있다. 양 어깨에 걸친 옷은 왼쪽 어깨에서 매듭을 지어 고리를 만들었으며, U자형으로 연 가슴에는 내의가 보이고 띠매듭이 있다. 오른손은 어깨까지 들어 엄지 손가락과 가운데 손가락을 맞대었고, 왼손은 검지와 가운데 손가락을 구부려 가슴에 대어 손등을 보이고 있다. 특히 손은 사실적으로 섬세하게 처리하여 생동감이 느껴진다. 머리 뒤에는 단순한 원형의 머리광배가 있을 뿐인데, 이를 지탱하는 자연광배가 몸광배 구실을 겸하는 것 같다. 얼굴과 두 손은 정교하게 조각한 반면 신체는 마치 돌기둥에 새긴 듯 옷주름을 간략하게 처리하였다. 이 불상은 각 부분의 표현이 힘있고 당당하면서도 세부수법에서 세련된 면이 보여 9세기 무렵에 만들어진 마애불상으로 추정된다. 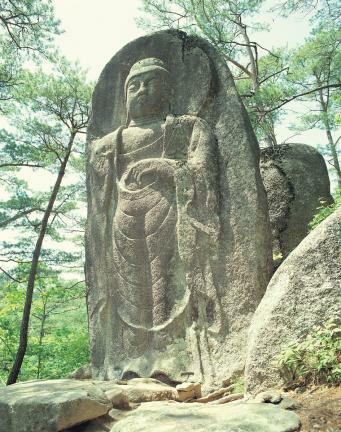 This rock-carved Buddha is located behind the Haeinsa Temple along the mountain path to the top of Gayasan Mountain. The topknot on the head is tall and large. 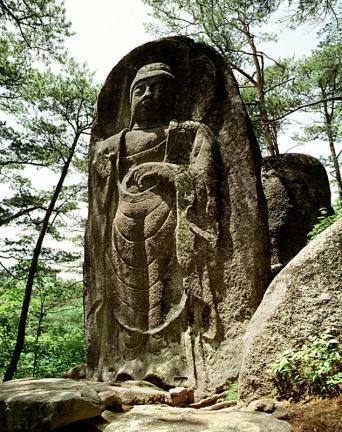 The Buddha has an unsmiling plump face, slanted eyes, elevated philtrum, thick lips and wrinkles in the chin. The ear lobes are long enough to touch the shoulders, and the three wrinkles on the neck are very deep. The shoulders are broad. The right hand is held to the shoulder with the thumb and index finger put together. The left hand is held to the chest with the back of the hand facing outwards and the index and middle fingers bent. The hands are very detailed and life-like. 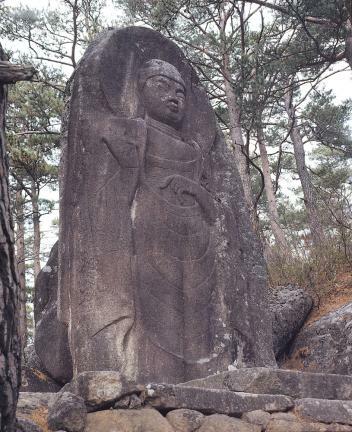 The robe on the shoulders is knotted at the left shoulder in a loop. The U-neck clothing has folds on the body. It has two mandorlas: one around the head and a natural halo that seems to serve as a “body mandorla.” Compared to the elaborate face and hands, the pedestal is simply designed. This Buddha has a powerful, dignified expression and a refined finish. 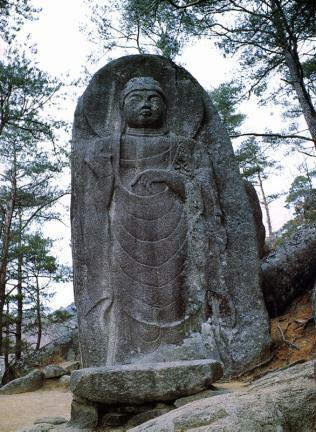 This rock-carved Buddha is believed to be a work of the 9th century.